I was just editing some MIDI drum tracks and noticed that there is no bar 6: It goes from 5 to 7. I haven't added or deleted any time. I know how to renumber bars but when I try to change bar 7 to 6 it eliminates 5 and 6 in terms of numbering. That was one of the first things I did. I'm @ 120 bpm, 4/4 time. The number of beats is correct, but it just skips 6. It's only a pain because I edit MIDI a lot and it can get confusing. You're not understanding what I'm referring to. When you zoom in or out on a track measure numbers can seemingly disappear. 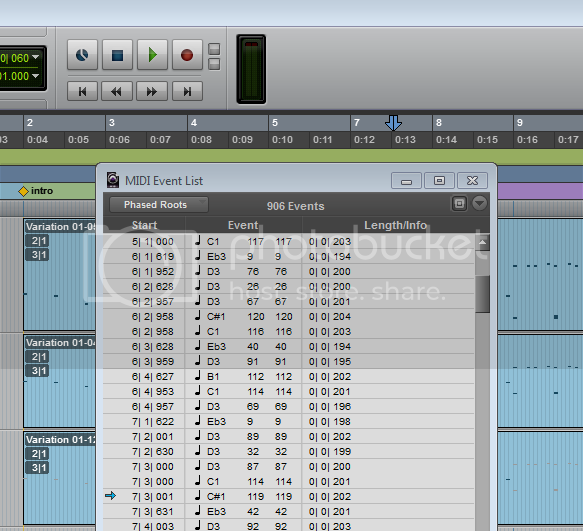 As a check look at the MIDI event list and see what's there. While looking there check the view filter and let everything show; I wouldn't be surprised if there is something there that's not showing for whatever reason in the edit screen. I checked the Midi Event List: "All" is selected. If you look at the track in the MIDI editor do the notes show there? Can you export the MIDI tracks as a .mid file and email them to me at my forum email address? I can try it here and see what comes up. Yes--midi notes are shown. Everything is normal in the edit window except there is no bar 6. In the midi editor there's also no 6 and the blue lines for the beats are missing for bars 5 and 6. Weird. Actually you sent me an email and I responded. You need to send the .mid file via your regular email provider to my Verizon email address which is where I got your email. Got the file; imported it into a new PT session and I can see notes in the top two tracks as well as the measure numbers in the edit screen. And all notes are seen in the event list. All bar numbers are showing in both the edit screen and MIDI editor. I would try a complete reinstall of PT and see what happens. Something I noticed is the notes used - is EZ Drummer using standard MIDI drum mapping or what? And the timing - is this something you played in or a preset pattern? If the latter do you have some kind of swing timing going on?